Summary AC1200 class router with USB 2.0 storage & printer sharing port. 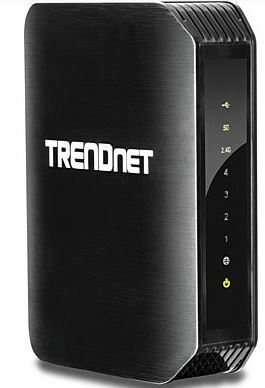 Back in June, we took a look at TRENDnet's top-of-line TEW-812DRU AC1750 class router. While it had a few highlights, overall it had unimpressive performance and a few other problems. Today we're going to look at a slightly less expensive and lower performance draft 11ac alternative, the AC 1200 class TEW-811DRU. The TEW-811DRU looks a lot like the TEW-812DRU, with the same upright format and many of the same front LEDs. The front of the TEW-811DRU has lots of LEDs for those who like blinking lights. There are LEDs for USB, 2.4Ghz, 5GHz, each LAN port, the WAN port and Power. The rear panel diagram below shows a sole USB 2.0 port and identifies the single Gigabit WAN and four switched Gigabit LAN Ethernet ports. Note that US consumers do not get a power button. Unlike the NETGEAR R6100, the TEW-811DRU has two dual-band antennas; which are shared between both radios. The large heatsink covers the Broadcom BCM47081A0KFEBG CPU. This is a lower-performance member of Broadcom's second-generation router SoC. The heatsinks came off with a couple of screws each, rewarding us with our view of the TEW-811DRU's naked chipsets. The largest chip is a Broadcom BCM47081A0 SoC that handles the main CPU, Ethernet and USB functions. The slightly smaller device to the left of the photo is the 5 GHz radio in the form of a Broadcom BCM4352 with two Skyworks SE5003L 5 GHz power amplifiers. At the top left of the photo is the BCM43217 that supplies the 2.4 GHz radio. This radio does not have outboard power amps. 64 MB of RAM and 8 MB flash finish up the design. Table 1 includes the NETGEAR R6100's key components for comparison.